The Collinsville Cardinals 5A State Champion Wrestling Team continued competing at a high level this weekend at the Geary Invitational wrestling tournament. The team finished 4th overall with 8 placers in the Tournament. Several of the wrestlers continued competing through extra effort challenge matches to achieve 2nd place status! The team has district matches Tuesday (Jan. 14th) at Edison High School for Dual State qualifying, then on to the Bobcat Classic Tournament in Kansas City next weekend. The Cardinal Wrestling team crowned 2 champions and finished 4th as a team in the Geary Wrestling tournament this past weekend. 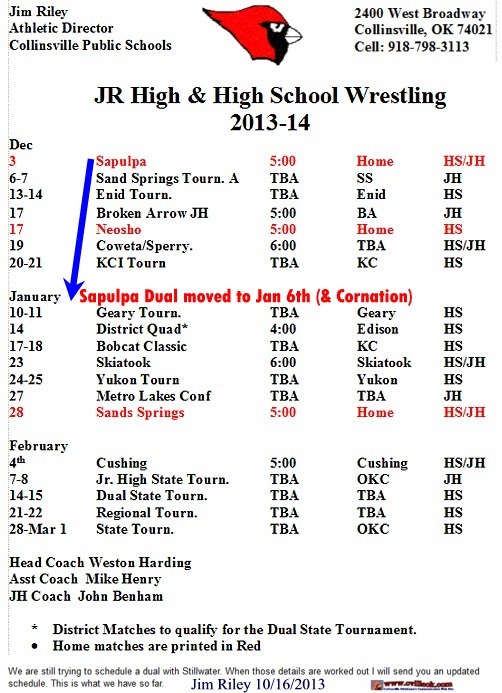 The 70th annual Geary Wrestling Tournament is set for Friday and Saturday, January 10th and 11th. Wrestlers from 24 schools will compete in the oldest high school invitational wrestling tournament in the nation. Geary Public Schools has an enrollment of approximately 420 students district wide. The district covers over 303 square miles in southern Blaine and western Canadian counties. ~ 50 Miles NW of OKC.